The high-pressure blocking the path of all six boats racing in Leg 5 of the Volvo Ocean Race from Auckland to Itajaí in Brazil has led to some changes on the leaderboard. The fleet has compacted to just 11 nautical miles (nm) from new leader Franck Cammas’ Groupama 4 to Iker Martínez’s Telefónica in fifth. Overnight, Telefónica enjoyed a brief spell in the lead while Mike Sanderson and Team Sanya overhauled Chris Nicholson and CAMPER with Emirates Team New Zealand to take up fourth place. At 1000 UTC Sanderson had risen to third place behind Ken Read’s PUMA Ocean Racing powered by BERG. Although conditions were reminiscent of a perfect sunny skiing morning, the racing is still intense. The fleet is now at 45 degrees south, around 250 nm east of the Chatham Islands. Groupama, PUMA and Sanya have taken a more easterly course, while CAMPER and Telefónica are 16 nm further south, Telefónica having passed astern of CAMPER in the past hour. The teams are looking to get around the bottom of a high-pressure ridge, which is blocking their path to the westerly depressions which would sweep the fleet towards the western edge of the ice limit 800 nm or so ahead. The ice limit is a line of around 800 nm, set at the latitude of 47.3 degrees south, which the fleet must keep to the north of at all times to avoid encounters with icebergs and growlers. Although all six teams have had damage to repair the fleet remains remarkably unscathed given the hideous conditions during the opening days of the leg. According to skipper Chris Nicholson, it was CAMPER falling off one of the many waves that caused the fracture to the bulkhead in front of the boat’s head. It is not a vital piece of structure, but one Nicholson needs to keep in one piece as it adds support the longitudinal frames, which he absolutely does have to have intact. The skipper reported this morning that CAMPER is now 100 per cent ready to go. “With the conditions that we had, I would be very surprised if these types of problems weren’t common place among the fleet,” Nicholson said. 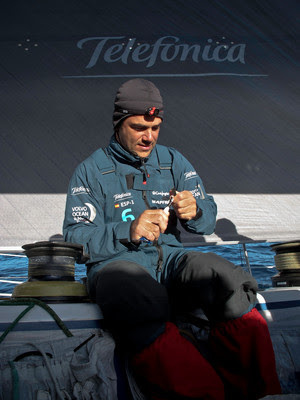 Mike Sanderson has had his share of worries onboard Sanya when, due to the heavy slamming, the water-maker pump failed. It wasn’t a simple fix and could have had catastrophic consequences had Richard Mason not been able to replace the pump and fix a leak at the end of the cylinder, which had broken free of its mountings. Added to this, the team were faced with the prospect of sailing without all-important weather information after both satellite domes went offline during the first night. Happily the fault was narrowed down to a cabling issue and Sanya’s communications now look to be functioning correctly. Ian Walker’s Abu Dhabi Ocean Racing 305 nm astern in sixth place have also been slowed by lighter winds however Walker senses an opportunity ahead to get back in the game. “The high will start to move north-east so hopefully we won’t have to go as far south to get round the bottom corner of it,” he said. “It’s disappointing. For the last 10 hours or so we have been stuck in light winds ourselves otherwise we could have made quite significant inroads to the fleet. “We’ve only done 400 nm and it’s slow going by any stretch of the imagination, but we are looking forward to a bit more breeze and hopefully start to narrow down the fleet in the next day or so,” Walker added. Although over the past day the crews have been largely concerned with avoiding sunburn and slatting sails this break in proceedings should give everyone the chance to gather renewed energy ready to face the next stage of the leg.